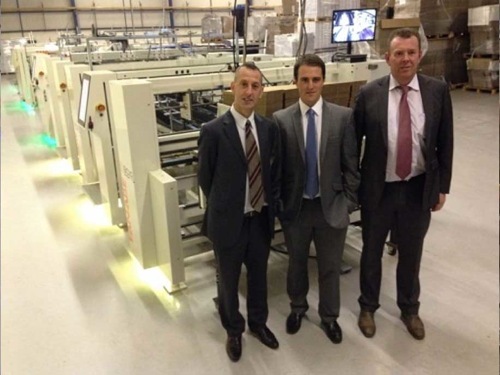 JDengineers installed the first TANABE-JD BoxR at Principal Packaging. According to the company’s owner, Mr. Tony Sharratt the TANABE JD BoxR was the best choice to run the product range of Principal Packaging. Principal Packaging provides the food industry with heavy quality PE coated solid board boxes for meat, also PE coated corrugated boxes are produced by Principal Packaging. 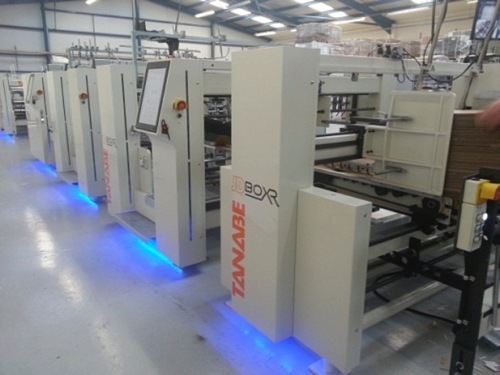 Because of its solid construction, the easy to handle operating system and short setup times, it makes the TANABE-JD BoxR a perfect “value for money” specialty folder gluer. Also the modular design is a profit. Adding more components like prefold, turning device or t-unit is very easy to do. The machine is equipped with both, a PVA non contact glue system and an hotmelt system for gluing PE coated boxes. Both systems are operated by the same glue controller and it possible to change from one to the other system without removing parts or adjusting offset values. In the beginning of next year the machine will be extended with a T-unit. With this unit, it is possible to fold leak proof boxes. JDengineers wishes Principal Packaging all the best with their new investment. Mr. Tony Sharratt, mr. Richard Sharratt of Principal Packaging and Mr. Doeke Holtrop of JD Engineers.